Reclaimed wood furniture is usually so predictable: large upcycled beams from buildings, or slabs of driftwood turned into benches and stools. Thats why Brent Comber’s unique reclaimed wood furniture – made from bundles of small irregular pieces – is such a breathe of fresh air. We discovered the Canadian designer’s innovative, eco-friendly furniture last year at ICFF, and it was one of our favorite things at New York Design Week. This year we are excited to see Brent Comber back and better than ever, with a beautiful new line of work called “Shattered”. 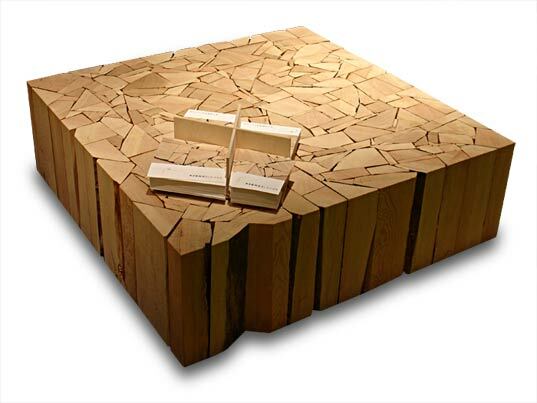 The Shattered design takes randomly shaped pieces of scrap Douglas Fir wood and fits them together like puzzle pieces to create a unified whole. The chaotic-yet-organize aesthetic reminds me somewhat of Incan stone-cut masonry (where every stone block is a different shape, yet fits together perfectly). Creating order out of chaos and efficiency out of random waste is a beautiful thing – and we applaud Brent Comber for this lovely and environmentally-friendly work. enviromentally friendly??? how much wood does he has to cut and waste to get those shapes and designs???? im pretty sure more gets to waste than what is used!!!! His stuff is really great. I have been working with him selling his pieces on the West Coast and he is a pleasure to work with as well as a very eco friendly business man. The Alder collection has been great and has worked in very contemporary homes as well as cabins and has even been used in commercial uses. The newer and random Shattered collection takes it to the next level and is my new favorite. And in response to another comment, All of his pieces are extremely strong and durable. Very beautiful things, but are they strong enough? Well done Brent, a great idea. i am a great lover of simple and atractive art and am presently involved with oak logs and granit / marbel slabs. Your idea of using fire wood is also my idea. Check out a stone mason or granit and marbel dealer for off cuts and broken pieces. It reminds me a folk art from Eastern USA in the early 1900's. Calm, Beautiful. That necessary touch of earth that would set well anywhere. Reclaimed wood furniture is usually so predictable: large upcycled beams from buildings, or slabs of driftwood turned into benches and stools. Thats why Brent Comber's unique reclaimed wood furniture - made from bundles of small irregular pieces - is such a breathe of fresh air. We discovered the Canadian designer's innovative, eco-friendly furniture last year at ICFF, and it was one of our favorite things at New York Design Week. This year we are excited to see Brent Comber back and better than ever, with a beautiful new line of work called "Shattered".